Saratoga, Events and Accommodations: 365 Reasons to Book Here, Now. We know of many people who check out of their favorite Saratoga hostelry on every Labor Day (Saratoga Race Course’s Closing Day)–and reserve their room for the following year. These savvy shoppers know that, as many hotels, inns and motels that lie within the city limits of our tiny, internationally-renowned town–there may not be a room available for Travers Week next year–or all of racing season, for that matter–unless they jump on it, 365 days in advance. Well, the cool thing about being a beautiful bed and breakfast in Saratoga–across from the Thoroughbred track and a casual walk to (literally) hundreds of restaurants, taverns, shops and attractions–is that Saratoga is hoppin’ all 365 of every year. We have horses. In spades. But we also have opera, theatre, ballet, modern dance, musea, Shakespeare, regattas, fireworks, parades, healing waters, spas, celebrations and parties every-other-day, it seems. Saratoga is The Consummate Tourist Town–and only about 30,000 of us are fortunate enough actually to live here all year ’round. So that leaves the rest of you with the rather exciting burden of sifting through the options, and finding the perfect bed in which to rest your weary bones at the end of your action-packed Saratoga Days. The day to get out your calendar. Talk to your S.O. about 2018, and the time(s) you’ll have free. OR, the events you absolutely need to attend. Then, with that information firmly written in INK in your calendar: SARATOGA, you call us at The Brunswick at Saratoga Bed and Breakfast, and line up your room for your chosen date(s). 2018 is just a few days away–literally. And you do NOT want to be left out in the cold–or the searing heat, depending on season. You want to dance merrily into the New Year, secure in the knowledge that all your hard work, all year-round will be rewarded–the minute you put up your feet in your own, special room here at our place on Union Avenue. To inspire you to quit pussyfootin’ around, and jump on it, check out this article posted this morning by Todd Garofano of the Saratoga Convention & Tourism Bureau. Apparently, 175 events already are booked at the Saratoga Springs City Center. Wowie-zowie. Note that most days, several events and activities overlap: oh, dear, more decisions to make! So now that you’re thoroughly overwhelmed, fear not. We are here for you. We’re on your side. We want you to have the most enjoyable, restful night’s sleep after a full day or eve of going/doing/seeing. And the Early Bird may get the worm, but you and your loved ones need a delicious, gourmet breakfast served up piping hot in a safe, cozy, beautiful, embracing B&B on Union Avenue. 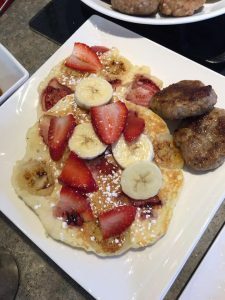 That is to say, you deserve to break the fast after a deep slumber here at The Brunswick at Saratoga Bed and Breakfast–and our Chef/Owner delights in creating Fare from the Heart. You deserve to be here–and, as much as every message on social media demands that you be distracted crushing candies or posting selfies–you simply must extract yourself from your yakking AI long enough to speak to an actual human, or at least email an actual human–and make your reservation here for all your Saratoga Escapes. (S)he who hesitates is lost, as they say…and those who reserve their rooms for 2018 no–are wise. Those who hesitate will be lost in 2018…driving up and down the Northway through the black Adirondack nights, just to get to a motel room. But for those of you who hesitate not, and reserve with us in time to get the room you want, at the time you desire: we promise all fun, no stress, sweets and treats served in a serene environment. Happy, healthy and prosperous New Year, from all of us at The Brunswick at Saratoga Bed and Breakfast. 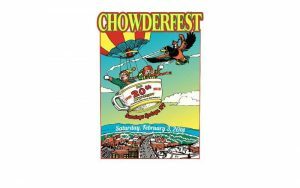 Posted in Brunswick Bed and Breakfast | Comments Off on Saratoga, Events and Accommodations: 365 Reasons to Book Here, Now. It’s the Friday before Christmas, 2017. YIKES. You’re stressing: either your boss is a Scrooge, and won’t let anyone leave work ONE SINGLE MINUTE before 5PM. OR, you’re trying your level-best to talk yourself into driving around–again–and shopping in person. You know that this option will turn you into a wild-eyed, frustrated, maniac who inhales Seattle’s darkest in one gulp. Now there’s a snow storm. You can’t see out your kitchen window. If you are nuts enough to go outside, that fool’s errand will end in you, sitting on a highway or main street, which now is a parking lot. You’ll scream, but no one will hear you because all windows are rolled up, and everyone else is screaming, as well. Here’s what you do: STAY HOME, Possums. 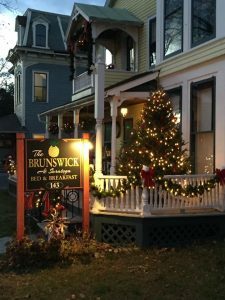 NOW…look here, on the ‘site for The Brunswick at Saratoga Bed and Breakfast–and see that, in a matter of mere moments–from the warmth of your home, as you drink hot cocoa and wear bunny slippers–you can buy THE BEST Christmas (or, fill-in-your-holiday, HERE) — gift, EVER. You can give a gift certificate for your loved one (family member, friend, boss, co-worker)–to rest, relax and refresh in the lovely Brunswick at Saratoga. 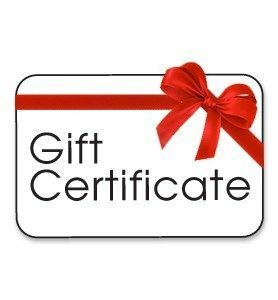 And the gift certificate (unlike a Chia Pet)–actually is a welcome gift. A gift that will give your dear one time to think about when they can make their escape to Saratoga–to get excited about their trip–and to anticipate the quiet beauty that awaits them here at our historic Bed and Breakfast. You get to maintain your sanity. You get to stay home, and not spend an entire day trying to fight your way to get to a store. A store where you’ll try to buy something that’s no longer in stock. And where the salesgirl will hate you, because SHE has shopping to do, too. AND–your loved one will receive a gift that they’ll actually LOVE. You need to do this. Because the people you love, deserve your very best. Because YOU deserve to stay sane, stay home and bake cookies. And because…Chia Pets are SO 1960s. 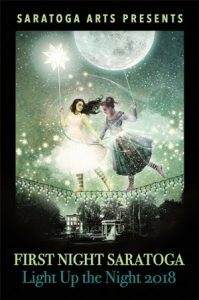 If you’re venturing forth to Saratoga Springs, New York for our singularly-fabulous First Night celebration, there’s only one hostelry in town that offers the quietude that you’ll need–and delightful snacks–as you steel yourself for stepping out, into the frigid Adirondack night. And, after freezing your nose and toes, and carrying roasted chestnuts and the memory of petting a reindeer into the next year–you’re going to need a deep, quiet sleep. 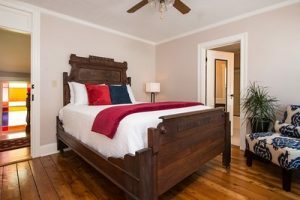 An overnight hibernation, of sorts: Return to your warm room here at The Brunswick at Saratoga Bed & Breakfast. Snuggle into your inviting bed…hunker down, and sleep deeply. Then, arise on New Year’s Day to a luscious breakfast that feeds not only your body, but your soul, as well. If you’re going to start 2018 with a new resolve, let it be to treat others as you’d like to be treated, yourself. And to do that, you have to be good to yourself, first–and kicking off the year with a great night’s sleep and gourmet breakfast raises the bar for the New Year. This year, instead of commuting in the freezing cold after a night of revelry in downtown Saratoga Springs–decide, now, to spend it here, with us. We’ll help you feel all warm and toasty, and ready to take on 2018 and all it has to offer. Four rooms are available, as I write this: C, 3, 6 and 7. Tempus fugit, friends–Time flies! Now is the time to reserve your hibernation den for First Night in Saratoga–and your personal resolve, to kick off the next year of your life relaxed, refreshed and rejuvenated.